A senior civil servant has said he does not "recall any resistance" from DUP special advisers to the RHI scheme being placed on the agenda during meetings. 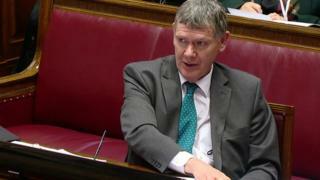 Andrew McCormick was appearing before the RHI public inquiry on Wednesday. The claim was made by former enterprise minister Jonathan Bell in his witness statements, which have just been published. Dr McCormick was the top civil servant in the department that ran RHI. He was asked about departmental meetings in the summer of 2015, shortly after Mr Bell became the enterprise minister, as attempts were being made to rush through changes that would stop the haemorrhage of public funds. Mr Bell has claimed in his witness statement that his special adviser, Timothy Cairns, said several DUP advisers did not "wish the RHI scheme to be on the agenda". Dr McCormick said he did "not recall any reluctance or resistance" from DUP special advisers to the RHI scheme being placed on the agenda during meetings. "That's the kind of thing I would remember," he said. Jonathan Bell is due to appear before the RHI inquiry on Thursday and Friday. When the scandal around the flawed green energy scheme first emerged in December 2016, Mr Bell made the claim that DUP advisers had pressured him not to close the scheme. The inquiry has already received evidence from Dr McCormick claiming Mr Bell had a tense relationship with his special adviser, Timothy Cairns. On Wednesday, Dr McCormick gave more details on that issue and about a row the pair had in a London restaurant in June 2015 over the extent to which Mr Bell was able, as minister, to take his own decisions without recourse to the wider DUP. He said the relationship "visibly wasn't" a good one, and that there was an abrupt tone - but it "didn't cross a line into abusive". Earlier, Dr McCormick told the inquiry senior officials in the Enterprise Department "rushed the fences" in their haste to fix the RHI scheme. He said by the summer of 2015 they could see the obvious issues, but no-one took time to consider whether there was a fundamental flaw that was causing them. Officials knew the RHI scheme was over budget, was attracting a sudden increase in applications and that approval for spending on the scheme from the Department of Finance had lapsed. But they failed to identify that the subsidy on offer was higher than the cost of the fuel for biomass boilers - the central flaw. "We were too focused on what we thought were the problems," Dr McCormick said. All this was happening at the time when the department had already been heavily criticised by auditors in respect of another project it had run. A Public Accounts Committee investigation and an audit office report in March 2015 found that "poor regard for value for money was endemic in the department" in respect of a cross-border broadband project called Bytel. Inquiry chair Sir Patrick Coghlin said had Dr McCormick not asked himself the question about RHI: "Could this be another Bytel"? Dr McCormick said the thought "did not crystalise. It probably should have". Dr McCormick was also asked about a claim from another official that he had "formally escalated" concerns to him about potential overcompensation for RHI applicants and suggested a way of suspending the scheme. At a meeting in June 2015, the official suggested that if RHI was in breach of EU state aid rules, it could give the department solid legal ground to stop it. Dr McCormick said it was "unfortunate" that the idea had not been pursued, though he disputed that it had been formally escalated, saying there was no record that had been done. Pressed on the detail of the email chain, Dr McCormick said he felt "very frustrated" that officials seemed to have gotten "so close to asking the right questions". On Wednesday, Dr McCormick also told the RHI inquiry he still struggles with why a whistleblower warning about the key flaw in the scheme was ignored by officials. Businesswoman Janette O'Hagan told the department in 2015 that it was being abused and businesses were burning fuel to harvest subsidy, but the warning was not followed up. Dr McCormick said he only found out about Ms O'Hagan's contact after RHI was closed. He said she had "exposed the fundamental error" after just five minutes of research. She had identified that the value of the subsidy being paid for renewable heat was higher than the cost of the fuel to run the biomass boilers. Dr McCormick said he could not understand why she had been ignored at a time when officials were beginning to realise they had a budget problem. He said he could see no "defensible explanation" why the information had not been acted on. It had been "glaringly obvious" and all it took was for someone to put "two and two together to get four". Dr McCormick said it was one of the most serious aspects of the case, but it was a delicate area because it impacted on potential disciplinary processes. The hearing also heard evidence about the working culture within the enterprise department when problems with the scheme first began to emerge. Inquiry panellist Dr Keith MacLean asked if staff were reluctant to speak out because of power struggles or took the view that "it's not my business and if I do say something I'll get my head bitten off for it". Dr McCormick said there should have been a message of conveying confidence to staff, adding: "Machiavelli said culture is the hardest thing to change." The senior civil servant also spoke of communication difficulties between civil servants in the energy and finance teams when it came to looking at the scheme's budget, which led to a reliance on emails. Dr MacLean asked: "Is this an example where someone should have gone along the corridor and banged heads together until they got an answer?" Dr McCormick said there was a culture of self-protection within the department, adding: "I know how that feels, I'm not immune to that kind of behaviour." He is due to appear to give evidence to the inquiry again in October.